Are you attending EclipseCon 2010? Does snacking on all that conference food (think chocolate fountains) make you feel guilty? Want to improve your 5K time :)? Well, I have good news. 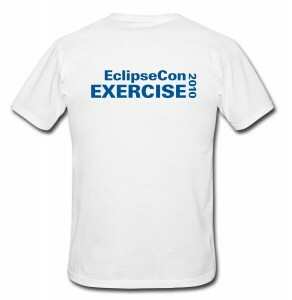 This year, EclipseSource has graciously sponsored the EclipseCon Exercise event. To attend, please register on the wiki and let the event organizers know that you’re coming. This year, we have something special for the runners due to sponsorship, technical tees! Anyways, I want to continue the tradition of morning exercise during the conference and I hope to see some fresh faces this year in the morning. There really is no better way to start off your morning than running through some fresh California air.